The focus of marine environment monitoring is changing from traditional sampling to continuous automated monitoring. 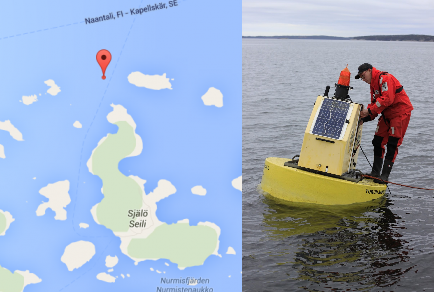 In the Archipelago Sea, north of Seili island, an automated monitoring buoy has been in operation since 2006. The station measures temperature (°C), salinity (PSU), turbidity (NTU), chlorofyll (mg/L), blue-green algae (cells/mL), and oxygen (mg/L). Results of environmental monitoring are important for understanding the state of the sea, and therefore are of fundamental importance to environmental management. Long-term observations also reveal trends and patterns that can help interpret experimental results or yield new research hypotheses. The station is composed of a YSI 6952 buoy base and a multiparameter sonde YSI 6000. The station has a current feed with solar panels, a winch, a datalogger to direct measuring and record the results and a GSM modem which automatically transfers the results to Masinotek’s EMMI environmental monitoring system, and from there to this website. For this reason, there is a short delay in the upload process. The station makes four depth measuring profiles from a water column per day. The winch moves the measuring device vertically in the water column and the measurements are taken at depth stages of one meter in a depth area extending from 40 m depth to two meters below the surface. The station is installed to operate in the spring as soon as the ice allows (with the objective of recording the spring blooming of phytoplankton in its entirety) and removed in early winter before the ice comes. The monitoring is carried out by the Turku University of Applied Sciences (TUAS) in collaboration with the Archipelago Research Institute of the University of Turku, the Finnish Meterological Institute and other FINMARI partners. In 2015, The Archipelago Research Institute added a weather station, measuring air temperature, pressure, humidity, precipitation, wind speed and direction to the buoy, which will be displayed on this website in the future. Temperature [°C] Sea water temperature from the surface to 40 m depth. The temperature begins to rise in May and concurrently thermal stratification begins to develop. The stratification is at its strongest condition in late summer when the surface mean temperature can exceed 20 °C and the deep water is ca 6-7 °C. The transition layer between warmer mixed water at the sea surface and cooler deep water below, i.e., a layer in which the water temperature drops rapidly, is called a thermocline. In the autumn, the surface water slowly cools down and eventually the thermocline disappears: the whole water column is then mixed by autumn storms and convection. Salinity [PSU] Sea water salinity in parts per thousand. In the Archipelago Sea, the salinity usually varies between 5,7 and 6,2. The more saline water is more dense and, therefore, the heavier saline water sinks to the bottom of the water column. In the Baltic Sea, the water column also has a vertical salinity gradient as well as a temperature gradient. In more deeper areas, a transition layer where salinity changes rapidly, a halocline, exists ca. 60-80 m depth. In the Archipelago Sea, however, the halocline is very weak or non-existent. In winters 2014/2015 and 2015/2016, large sea water inflows (salt pulses) arrived to the Baltic Sea, which effects are expected to arrive soon. It is estimated that the pulses could potentially increase the water salinity in the area as high as 7 parts per thousand, the highest number since the 1970s. Oxygen [mg/l] Dissolved oxygen content in the water column. Seasonal changes affect dissolved oxygen concentrations. Cold water can hold more dissolved oxygen than warm water, therefore the oxygen content is higher during the cold water period. In summer,due to thermal stratification, the near-bottom oxygen concentrations can be quite low. Warmer temperatures also speed up the photosynthetic rate’s in phytoplankton, which can be observed as elevated oxygen concentrations in the surface especially during phytoplankton blooms in April-May and late summer. Chlorophyll-a [ug/l] Reflects the biomass of microscopic algae in the water column. Planktonic algae require sunlight for photosynthesis, therefore their abundance is the highest in the surface layer. The highest chlorophyll concentrations are measured during phytoplankton blooms. BGA [cells/ml] Blue-Green Algae (cyanobacteria) concentration in the water column. BGA also require sunlight for photosynthesis. The concentration of BGA is the highest in late summer. During calm wind conditions, BGA can increase to very high densities. Turbidity [NTU] Clarity of sea water and the content of material that causes water to be turbid. In general, the turbidity of sea water increases towards the bottom of the water column. Material that causes water to be turbid include clay, silt, finely divided inorganic and organic matter, algae, soluble colored organic compounds, and plankton and other microscopic organisms.